Jefferson Lee Davis rushes to Holly Creek when his favorite Uncle Sherman has a bad fall. With his uncle unable to go about his normal duties, Jefferson Lee takes over his uncle's blog. As the days turn into weeks, Jefferson Lee finds himself getting more involved in the hustle and bustle of preparing for Dogwood Days - the town's biggest festival. But there is this growing attraction to Sheriff Zane Yarbrough that is complicating things plus his unemployment status to contend with. Will the city pull him back or will the town he had grown to love make him stay put? This story about an American small town with its quirky residents and politics had me from the start. Having grown up in a small town myself, I could not help but feel nostalgic as I read my way through. I enjoyed everything and every character in it so much that I did not realize I had already reached the book's end and I was still expecting for more. The characters, despite their flaws, are all endearing in their respective ways. Uncle Sherman and Jefferson Lee's closeness reminds me of myself and my nephews whom I treat like my own children. The town's communication network is faster than the speed of light. Everyone is ever watchful if anything is out of order. Squabbles occur now and then but are easily resolved especially if the motives behind such petty arguments or misunderstandings are for the benefit of the community. Clover Crofton, Jefferson Lee's sassy childhood friend, is a hoot. Her beauty, wit and charm can disarm anyone that crosses her path. She is easily my favorite character in the book. Another thing that I liked was how Jefferson Lee and Zane's relationship progressed. The pacing was not rushed nor did it proceed at a slow tempo either. 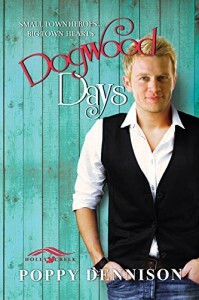 There is so much to love about Dogwood Days and I could go on and on about it but I wouldn't want to spoil your fun. The author's writing was flawless and her story made me long for my own hometown and it brought back a lot of happy childhood memories. Overall, Poppy Dennison's latest book had a heart of its own with just the right tad of smexiness thrown in. I almost did not get to read this book but I am so glad that I had the chance to do so or I would have missed a lot. It was a joy to read and it comes highly recommended!